I am writing this on a cold snowy day in Chester County, wishing for warmer weather. One event that several of us in my cohort are planning to attend when the weather allows for sunscreen and shorts is the Walk Now for Autism Speaks event. The Philadelphia walk will take place in September 2013 (date TBA) at Citizens Bank Park. 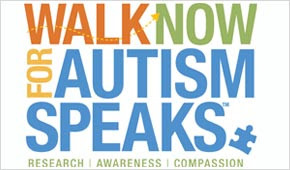 Walk Now for Autism Speaks is the nation's largest grassroots autism walk program that seeks to fundraise for autism research, provide family services, and raise awareness about the increasing prevalence of autism. It is great events such as these that really bring people together over a common cause. There are walk locations throughout the country from April to November. Total Philadelphia donations have already exceeded $18,000! If you are interested in participating or creating a team to fundraise, visit the link below.